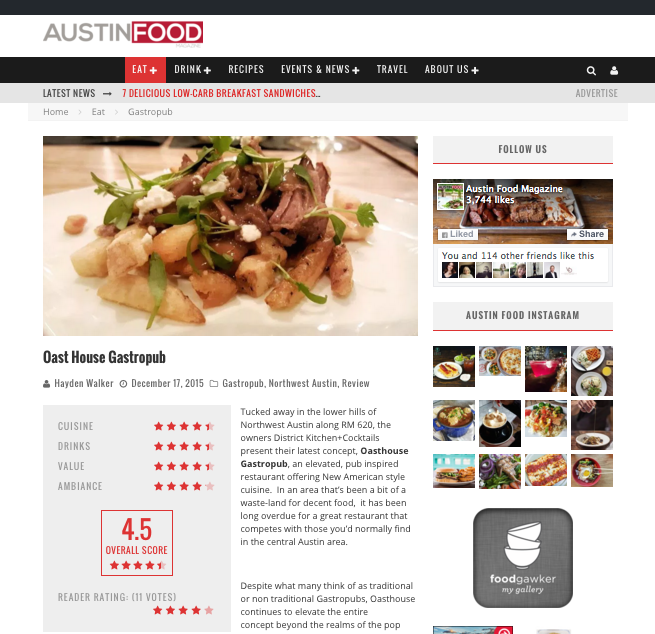 See what the experts at Austin Food Magazine had to say about Oasthouse Gastropub. Tucked away in the lower hills of Northwest Austin along RM 620, the owners District Kitchen+Cocktails present their latest concept, Oasthouse Gastropub, an elevated, pub inspired restaurant offering New American style cuisine. In an area that’s been a bit of a waste-land for decent food, it has been long overdue for a great restaurant that competes with those you’d normally find in the central Austin area. Despite what many think of as traditional or non traditional Gastropubs, Oasthouse continues to elevate the entire concept beyond the realms of the pop culture definition. With it’s chef driven, elevated pub fare curated by Executive Chef & Owner Amir Hajimaleki, over 20 distinct craft beers on tap, craft cocktails and an impressive wine list that showcasing grapes from around the world, Oasthouse has brought a much needed culinary face lift to a community that’s been begging for decent food for years. The restaurant’s design is the epitome of old meets new with reclaimed wood and rustic art pieces to providing an authentic industrial feeling in a modern space. The interior features an spacious dinning room, expansive bar area, and indoor and outdoor patios. The menu is mostly seasonal and heavily Texas driven with dishes inspired by traditional German cuisine. Our favorites were Bangers & Mash which includes English peas, pickled onions, green tomatoes and a bucket head ipa glaze. I’m a huge sucker for a great burger so the Farmhouse Pub Burger was my favorite. It’s stacked with grass fed beef, Guinness cheddar, sunny duck egg, brown ale bacon mustardo and on buttery brioche bun. I’m actually impressed by the Texas Shepherd’s Pie with prime tenderloin, carrots, green peas, onions, and 512 pecan porter braise topped with a sweet potato mash. It’s like a classic was brought back to life just in time for the cold season of the year, so it’ll keep you jolly and fat for the upcoming winter months. The bar features an excellent selection of unique spirits, international wines and 21 beers on tap. Much like the cuisine, the cocktails are also seasonally driven but features classic libations like the Old Fashioned and Manhattan. Original cocktails like the Beerhound with 4th Rap Long Walk Grapefruit IPA, rosemary simply syrup and lemon juice, and the Oasthouse 75 with mandoria grappa, lemon juice, grenadine and sparking rose.